The life of the fur trapper was often lonely, usually dangerous, and always hard. 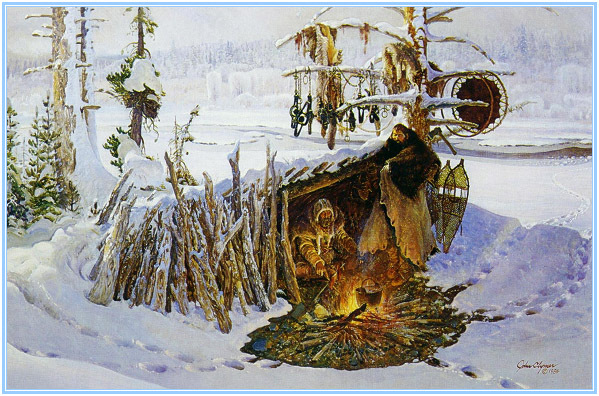 In Trappers’ Tree by John Clymer two trappers find scant shelter in a lean-to from a Rocky Mountain winter. 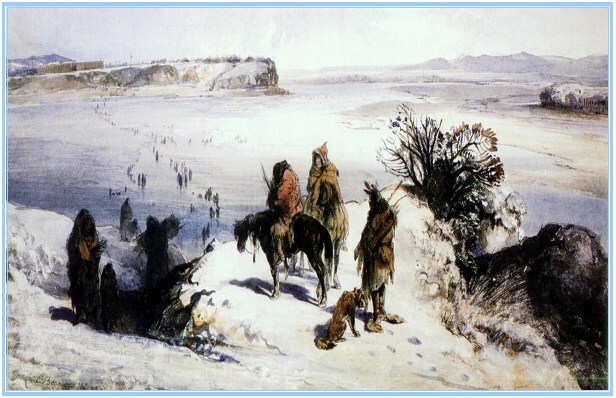 Karl Bodmer accompanied German naturalist Prince Maximilian of Wied-Neuwied to America and then, starting in April 1833, journeyed with him more than 2,000 miles up the Missouri to the American Fur Co. remote trading post in Blackfoot Indian country near the river’s headwaters. Bodmer worked industriously during the winter of 1833-34, producing magnificent paintings of the Missouri frontier and the Indians who lived there. This site designed, maintained and provided as a service to the buckskinning community by Arco Iris Web Designs, LLC. Copyright 2007.